Animal tissues. Striated skeletal muscle. Atlas of Plant and Animal Histology. 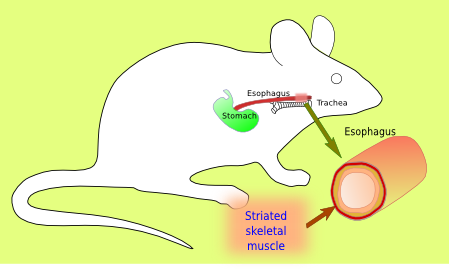 The image is from the upper part of mouse esophagus. Put the cursor over the mouse to see where the image came from. 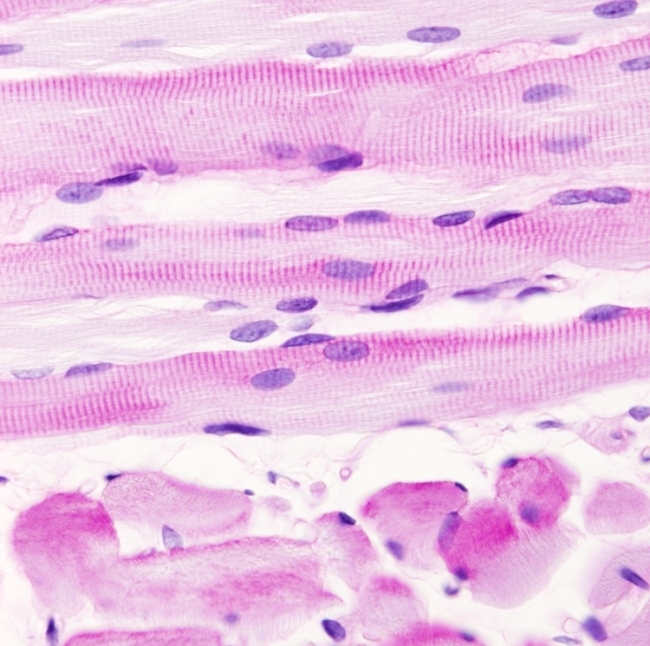 Striated skeletal muscle cells from the upper part of the esophagus of a mouse. They are observed in a longitudinal orientation, middle and upper part of the image, and in a transverse section, lower part of the image. This type of muscle is substituted by smooth muscle as we move toward the stomach. In the longitudinal view, it can be noticed the length of the striated skeletal muscle cells, that is why they are also known as muscle fibers. They contain many nuclei located at the peripheral cytoplasm, close to the cell membrane or sarcolemma. Perpendicularly to the long axis of the cell, many dark striations are observed, which are a consequence of the overlapping of the cytoskeleton filaments at regular space intervals. In the transverse view, the nuclei are observed at the periphery of the cells and there is scarce connective tissue in the extracellular spaces. White spaces between cells are artifacts consequence of the retraction of the tissue due to the histological processing technique.